Thank you Kathy~It was great working with you! DeeLuxe Bartending and Event Staffing provides an absolutely amazing service. We just had Dee tend our event. Her services are reliable, friendly, and she constantly went above and beyond to serve in every capacity. I simply cannot say enough good things about DeeLuxe, WILL hire again. Stop looking around, call Dee now. You will be happy you did. Dee was a huge help in planning and arranging the bar for our sons wedding. Dee was great to work with for our wedding reception! She was professional, responsive, and friendly throughout the process. Dee had a call with us prior to our reception to go over recommended amounts and timeline, which was very helpful. 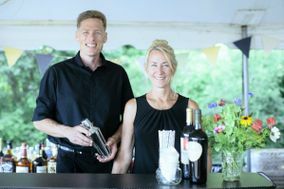 Our two bartenders, Tammi and Rob were great at the reception too. Dee was great to work with while planning the event. The bartenders that were at the event were fun and friendly!! I would absolutely recommend using DeeLuxe Bartending!! They know what they are doing. The Bartenders were professional, friendly and very attentive to guests. Very happy with the service. Dee and her team were absolutely amazing! Before our wedding, Dee provided her time and expertise to help us decide on signature cocktails and determine how much alcohol to purchase. Morgan and Deb were our bartenders for the evening, and we were so happy with their excellent service and professionalism. The setup looked great, and they saved the day when one of the couplers wasn't working on the jockey box. And, they were amazing enough to give us a ride downtown after the reception ended! Casey~Thank you so much for the awesome review! We had a great time working with you as well! We wish you both a wonderful life together full of love, health and happiness! Congratulations! Deeluxe was recommended by the catering company I had hired for a private corporate event for the top executives at my company. I am so glad I took the recommendation. Dee and Helen were amazing to work with from the initial planning to crafting an award-winning sangria through the event itself. Helen bartended and showed up on time and fully prepared. She knew exactly what needed to be done and even helped when there was a last minute upset at the venue that required us to adapt. The service was incredible and the execution was flawless. All of the executives were very happy - which makes my life as an Executive Assistant so much easier. I highly recommend them and hope to work with them again soon. Thank you so much to Dee and her team for an amazing event experience. Highly recommend! Thank you Sara~It was a wonderful celebration in a beautiful setting! Our best to you both! Dee at DeeLuxe bartending and her team came through for us on our big day in so many ways. From moving the bar multiple times due to weather to being flexible with our schedule, they were always able to roll with the challenges of an outdoor wedding. Thanks to DeeLuxe, our guests were happy (and appropriately served) and so were we! Dee and her crew are fantastic. We hired them to bartend our wedding. They went beyond to assure we had just what we wanted. Despite a sudden, huge rain storm that broke out right at the start of the wedding, the crew managed beautifully. They made all our guests feel welcome and working with Dee was a dream. I can't say enough about them!! We hired DeeLuxe Event Staffing for our wedding a couple weeks ago and they were fantastic! Dee was great and very responsive when I had questions. We did all our own planning but really needed someone on the day of to take care of all the little things. We had Alivia for most of the night and I can't say enough good things about her! She helped out with so much that I didn't have to worry about who was going to put out the appetizers at cocktail hour, replenish things that were running low, help with cake cutting, the list goes on. She really put our minds at ease and made it so the we could all just enjoy themselves. Thank you again Deeluxe! Thank you so much for the great review and I'm so happy you were happy with Alivia and her service! You were also great to work with! Congratulations and best wishes to you both! We used DeeLuxe Bartending last weekend for my wife's 50th birthday party and what a great job they did. Alivia was our bartender and was very personable and attentive. All of our guests were complimentary about her service and personality. Dee herself was wonderful to work with setting up the event. I would definitely use Dee again! Absolutely phenomenal, professional, extremely efficient! Would recommend to anyone! We had a last-minute scramble to find a bartender and were so, so fortunate to find that Dee and her team were available for our wedding day! Dee was so kind and accommodating and really listened to all of our very specific needs and visions. DeeLuxe recreated our custom-made signature cocktails and all of our guests loved them! Dee also thinks of everything, and we were happy to hand all of the bartending details over to her, right down to cups and ice. I am so thrilled that Dee and her team were a part of our wedding day! Thank you so much for your kind review! We were so happy to be a part of your celebration! We had a great time whipping up these fun signature drinks and they were a big hit with your guests! We wish you both the best in your new life together and thank you again for allowing us to be a part of your vendor team and your special day. Congratulations again! Dee and her team are awesome! Dee was very easy to work with leading up to our wedding, and provided all bar services we needed day of which was amazing (bartenders, ice, trash). The bartenders were very professional and the setup looked great! Dee and her team made the bar piece of our wedding very stress free! Katie~Thank you so much for the wonderful review! It was great working with you throughout the planning process. Congratulations on a beautiful celebration and we wish you both a life full of health, happiness and love! DeeLuxe did the bartending for our wedding this past summer at The Fells. Coordinating everything with Dee was very easy, she was easy to work with and very helpful. We intended to bring in all of our own mixers and realized the day before our wedding that we got wrapped up in all the fun and family time of the week that we completely forgot. We contacted Dee to ask if we could make the last minute change to include all of the ice and mixers and she made it happen. The bartenders at our wedding were very professional and friendly. My husband and I would definitely recommend DeeLuxe to anyone looking for a bartender for their event. Dee and Rachel were wonderful to work with for my son's rehearsal dinner which was a Lobster Bake at a state park and they worked so hard to make everything perfect for our party! They were efficient, reliable, and positively wonderful with all of the guests! I'd use them again for any function! Thank you so much for the great review. Rachel and I had a great time serving at your event~what a fun rehearsal dinner and wonderful family and friends! Thank you again for choosing DeeLuxe~congratulations and best wishes to all of you! Dee is incredibly responsive, helpful, and patient with the planning process, and the bartender we had for our event was equally fantastic! Highly recommend Dee and her company to anyone who is looking for a great bar experience for any event! Thank you so much Kena! We were so happy to be a part of your celebration~it was wonderful working with you. Best wishes to you both and congratulations! Dee was incredibly helpful and communicative in the months leading up to our wedding. She helped plan our bar menu and provided accurate estimates of how much alcohol we would need. On the day of the wedding, Dee and Kevin did a great job keeping everyone happy. We used DeeLuxe for a 50th party in our home for 50 people. Dee first of all is lovely. She also is very professional and responsive. She was easy to communicate with and very flexible. She brought us some creative ideas as well. My guests loved her. She is friendly, accommodating and organized. She helped ensure my guests were having fun and well taken care of. Highly recommend DeeLuxe Bartending. Dee was so pleasant and helpful as we decided where and how to set up the bar/catering and general flow of the party within our home. She had great ideas for specialty cocktails and was wonderful with all of our guests. Would not hesitate to recommend her! Wow. DeeLuxe was just fantastic. My (now) husband and I threw an unconventional event and DeeLuxe was the perfect fit for us. They rolled with the unexpected (there was a lot) and anticipated needs we didn't know we had. The two bartenders were friendly and professional and just plain awesome. I would use DeeLuxe again and can recommend them wholeheartedly. We were so thrilled with Dee and DeeLuxe bar tending service. She came recommended by our venue as several other couples had started to use her and from our first conversation we felt she was a perfect fit. She was responsive and professional and answered all our gazillion questions. Since our venue was very much DIY, it was essential for us to have a partner that understood the space and its requirements and restrictions. She was flexible to work with our other vendors and even offered some amazing touches that made the day even better. For instance we hired food trucks for catering and one truck was providing a specialty non alcoholic beverage (Thai basil limeade). Not only did Dee agree and work with her team to turn these drinks into a specialty drink, but also in the 11th hour offered to bring different containers for them as we found out the food truck was placing them in large (rather hideous) Cambros. She brought this wonderful aesthetic to the wedding - it's the attention to detail and enthusiasm for success that sets her apart. Our guests are still talking about those specialty drinks! Thank you Dee for making our day so special (and boozy)! ????? Thank you Samara for your review. We had such a wonderful time serving at your reception. Such a fun, friendly crowd and full of love and laughter! Congratulations and Best Wishes to you both! Dee of DeeLuxe Specialty Bartending Services provided the beverage service for a wedding reception at our home. From the early planning stages to the day of the celebration Dee was a pleasure to work with. She was responsive and patient with all of our questions and requests. Dee and Morgan provided the Bartending service the day of the event and they were fabulous. They were professional, attentive and everyone had good things to say about them. We were so pleased that they were part of our celebration. It was comforting to know that the bar was in such good hands! We would not hesitate to recommend DeeLuxe, in fact we already have, and we will use their Bartending services again for the next celebration!